We continue with the catecheses on the Holy Mass. 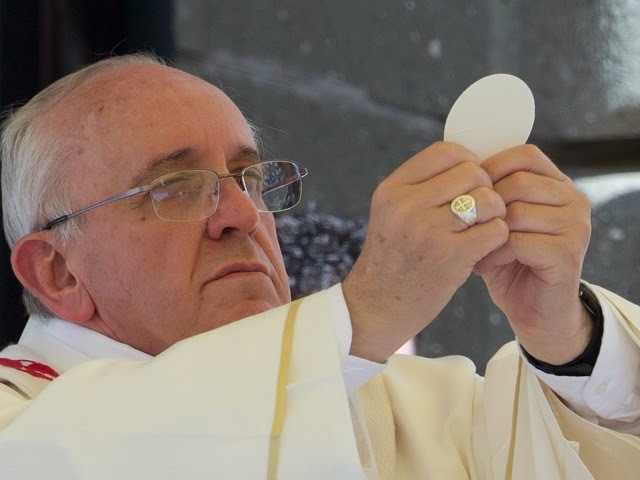 To understand the beauty of the Eucharistic Celebration, I want to begin with a very simple aspect: the Mass is prayer, rather, it’s the prayer par excellence, the highest, the most sublime and, at the same time, the most “concrete.” In fact, it’s the encounter of love with God through His Word and the Body and Blood of Jesus. It’s an encounter with the Lord. However, first we must answer a question. What is prayer really? It is first of all dialogue, personal relationship with God. And man was created as being in personal relationship with God, who finds his fulfilment only in the encounter with his Creator. The journey of life is towards the definitive encounter with the Lord. The Book of Genesis affirms that man was created in the image and likeness of God, who is Father and Son and Holy Spirit, a perfect relationship of love, which is unity. From this we are able to understand that all of us have been created to enter into a perfect relationship of love, in a continuous giving and receiving of ourselves to thus be able to find the fullness of our being. When Moses received God’s call in front of the burning bush, he asked Him his Name. And what did God answer? “I am who I am” (Exodus 3:14). In its original meaning, this expression expresses presence and favour, and, in fact, immediately after God adds: “The Lord, the God of your father, the God of Abraham, the God of Isaac, and the God of Jacob” (v. 15). Thus Christ also, when He calls His disciples, He calls them so that they will be with Him. Therefore, this is the greatest grace: to be able to experience that the Mass, the Eucharist is the privileged moment to be with Jesus and, through Him, with God and with brothers. To pray, as every true dialogue, is also to be able to remain in silence, — in dialogues there are moments of silence –, in silence together with Jesus. And when we go to Mass, perhaps we arrive five minutes early and we begin to chat with the one who is next to us. However, it’s not the moment to chat: it’s the moment of silence to prepare oneself to dialogue. It’s the moment to recollect oneself in the heart to prepare oneself for the encounter with Jesus. Silence is so important! Remember what I said last week: we are not going to a show; we are going to an encounter with the Lord, and silence prepares us and accompanies us. We remain in silence together with Jesus. And from God’s mysterious silence gushes His Word, which resounds in our heart. Jesus Himself teaches us how it is really possible “to be” with the Father and He demonstrates it with His prayer. The Gospels show us Jesus who withdraws to places apart to pray. The disciples seeing this, His intimate relationship with the Father, feel the desire to be able to participate in it, and they ask Him: “Lord, teach us to pray” (Luke 11:1). We heard it in the First Reading at the beginning of the Audience. Jesus answers that the first thing necessary go pray is to be able to say “Father.” Let’s be careful: if I’m not capable of saying “Father,” I’m not capable of praying. We must learn to say “Father,” namely, to put ourselves in His presence with filial confidence. However, to be able to learn, it is necessary to recognize humbly that we are in need of being instructed, and to say with simplicity: Lord, teach me to pray. This is the first point: to be humble, to recognize ourselves children, to rest in the Father, to trust Him. To enter the Kingdom of Heaven it’s necessary to make oneself little as children, in the sense that children know how to trust, they know that someone will take care of them, of what they will eat, of what they will wear and so on (Cf. Matthew 6:25-32). This is the first attitude: trust and confidence, as a child towards his parents’ to know that God remembers you and takes care of you, of you, of me, of all. The second predisposition, which is also proper to children, is to let oneself be surprised. A child always asks a thousand questions because he wants to discover the world, and he marvels even at small things, because everything is new to him. To enter in the Kingdom of Heaven it is necessary to let oneself be surprised. I ask, in our relationship with the Lord, in prayer, do we let ourselves be surprised or do we think that prayer is to talk to God as parrots do? No, it’s to trust and to open one’s heart to let oneself be surprised. Do we let ourselves be surprised by God who is always the God of surprises? Because the encounter with the Lord is always a living encounter, it’s not a museum encounter. It’s a living encounter and we go to Mass not to a museum. We go to a living encounter with the Lord. In the Gospel there is talk of a certain Nicodemus (John 3:1-21), an elderly man, an authority in Israel, who goes to Jesus to get to know Him, and the Lord speaks to him of the need to be “born anew” (Cf. v. 3). But what does it mean? Can one be “reborn”? Is it possible to have again the taste, the joy, the wonder of life even in face of so many tragedies? This is a fundamental question of our faith and this is the desire of every true believer: the desire to be born anew, the joy of beginning again. Do we have this desire? Do each one of us always have the desire to be born anew to encounter the Lord? Do you have this desire? In fact, it can be easily lost because, given so much activity, so many projects to implement, at the end there is little time left and we lose sight of what is fundamental: our life of the heart, our spiritual life, our life which is encounter with the Lord in prayer. In truth, the Lord surprises us by showing us that He loves us also in our weaknesses. “Jesus Christ [. . .] is the victim of expiation for our sins, and not for ours only but also for the sins of the whole world” (1 John 2:2). This gift, source of true consolation – but the Lord forgives us always – this consoles, it’s a true consolation, it’s a gift that is given to us through the Eucharist, that nuptial banquet in which the Bridegroom meets our frailty. Can I say that when I go to Communion in the Mass, the Lord encounters my frailty? Yes! We can say it because this is true! The Lord encounters our frailty to take us back to our first calling: that of being in the image and likeness of God. This is the environment of the Eucharist; this is prayer.